I couldn't have been happier because of the previous day, June 23rd, I had captured surprise thunderstorms over my home area including my meanest storm structure scenes in years so I was buzzing and somewhat high when I returned home at sunset after what turned out to be yet another day of rewarding storm chasing during what is turning to be the best season in a long time. There was a chance of storms again the following day, Friday June 24th, that night I asked the universe if it could treat me one more time, I even said that a funnel cloud would be nice. I was up early on Friday morning to review the set up and see what the latest models were showing. 700-800 CAPE, LIs of -3 with a NWly flow sporting good lapse rates with cold air aloft and strong solar heating expected. There was no hint of shear however there would be surface convergence inland triggered by sea breezes which would provide an additional form of lift and focus for storm initiation wherever these convergence zones formed. Overcall I decided that this day was going to be messy in comparison to the previous day which offered good wind shear so without any upper air support cells would be short lived and pulsey and with models showing a lot of precip I just knew there would be little in the way to offer in the structure department, that was the negative, however the positives were the good CAPE, weak capping inversion and the convergence zones which in conjunction with slack winds meant that there would be a risk of funnel clouds, I admit that I love slack flows on warm days, especially with low cloud bases on home grown surface based convection for these set-ups often have produced funnel clouds in the past. 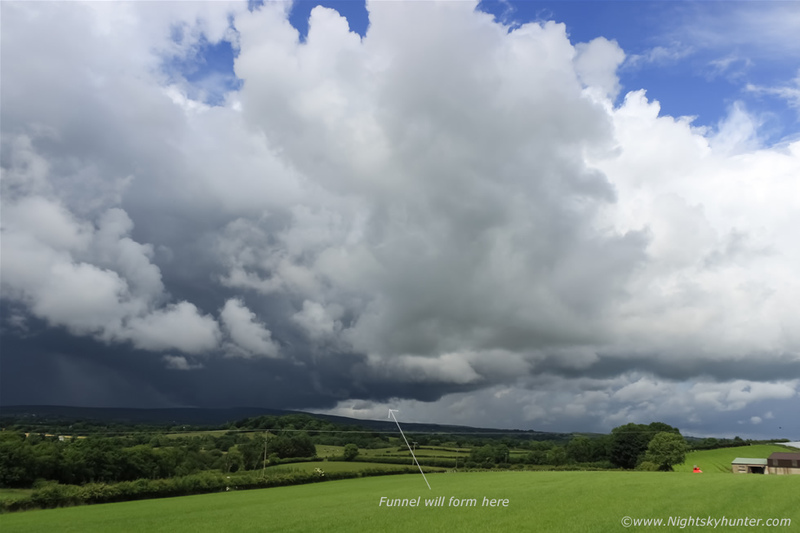 This theory was supported by other convective outlooks which all highlighted the risk of funnel clouds, weak tornadoes and hail up to 1.5cm in diameter, I was chatting with Conor McDonald, John Fagan and Paul Martin on facebook the previous night about the set up and based on the precip charts I figured that the Sperrins, Lough Neagh, Tyrone and Armagh/Down would be the best areas to target so I settled on the idea of Lough Neagh since since it has a history of vortex phenomena. 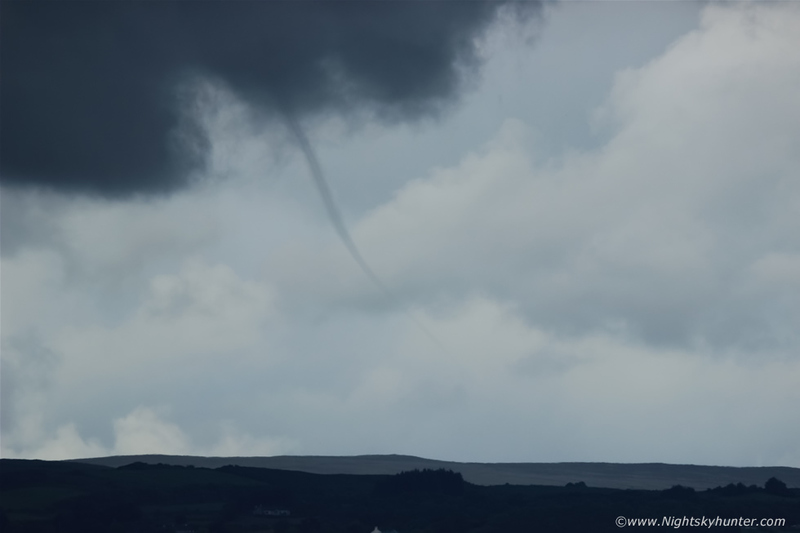 During Friday morning I changed my plan, I was liking what I was seeing from Maghera, convection was forming early and already looked mean and I could see obvious inflow motion and slow rotation under young bases so I knew there was going to be funnel clouds so I decided to resist the temptation to go chasing far from home so I instead used my brains and stayed where I was to monitor the sky visually. The radar was already dotted with moderate strength showers and I knew by mid afternoon all this was going to be a wet mess with solar heating shut off, if it was going to happen it needed to do it early. 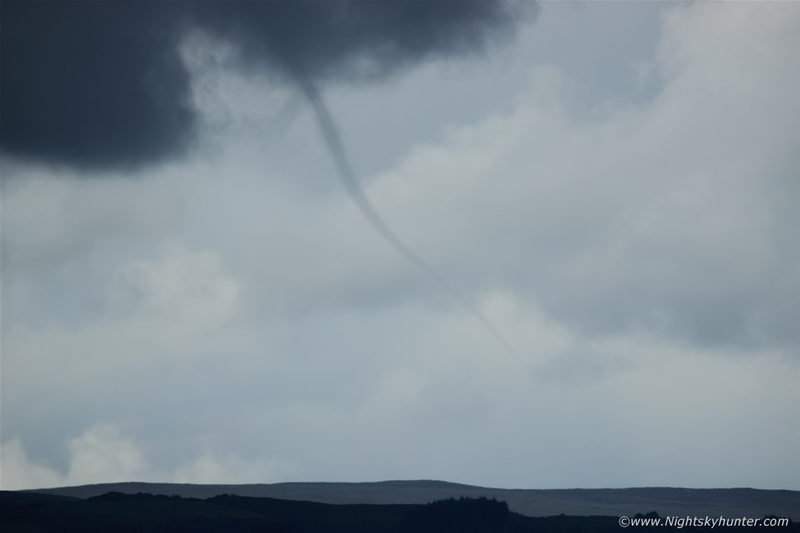 Then imagine my shock and delight when I seen a post on twitter showing an image of a rope funnel cloud from Garvagh captured at 11.00, it looked a good one too and Garvagh was only 20 min's up the road from me, this day was for real and funnels were happening and it seemed this section of the country was producing the goods. I could see why, the showers over the S of NI were clustered and messy getting in each other's way, when they did that solar heating would be shut off and the showers outflow would inhibit or completely undercut any warm moist air for new convection to feed on. However further N and NE there where fewer cells, they were more isolated and in sunshine and the air was still warm and humid so these discrete cells were stronger and still feeding on the juice and unstable air and with calm conditions in the sunshine new towers could easily start to spin up funnels with nothing to get in their way, I had a strong feeling that there was going to be more....very soon. One of those strong cells was to the west of Maghera sitting over the mountain showing a good core on radar, I walked out into the back garden for a look, I have to say the sky looked as mean as hell in that direction, all I could see was a moody wall of metallic blue and grey heavy clouds producing a lot of precip while behind it was a line of towers feeding into the cell, I decided this needed watching, especially those new towers so I trusted my instincts and left home at 12.30 and drove out the road a few minutes distance and parked on a hill overlooking the countryside with a perfect view to the N, NW and W.
This was my view from the hill facing NW, big angry cell to the left with flanking line of new towers extending back to the N (right) from it, these new towers looked good, full of life, the sun was heating my face and as I watched the tops of those towers began to expand in real time, the air felt warm and humid and there wasn't a breath of wind. You can see the dark base sitting over the Cairn mountain however it was that section of scud to the right which got my attention. As I watched the scud was rising into the base exhibiting inflow motion, those cells were feeding off the warm moist air at the surface, soon the scud looked more blocky in nature as it was trying to morph into a new shape, suddenly my heart began to beat faster and my eyes sharpened, then the left side of the scuddy lowering began to take on a linear form and I thought to myself ''is it, or isn't it?, my heart and mind were screaming funnel. I knew something was going to happen however I needed my wits about me, the worse thing to do in these situations is to just stand there frozen to the spot unsure of what to do, when you feel that sensation immediately break the trance and take decisive action. 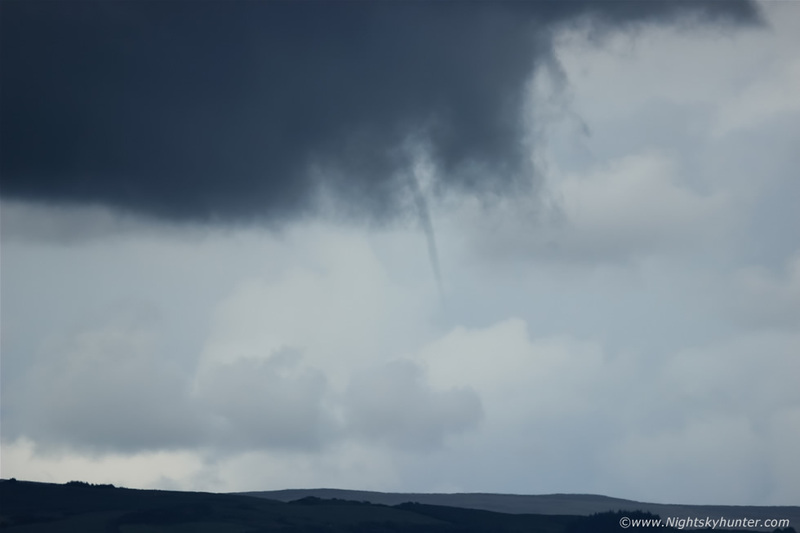 I instantly walked around the side of the van, opened the door, attached the Canon 100-400mm USM telephoto lens and turned around for another look and there at 12.40 BST was a funnel cloud! It began as a straight dark tube which was extremely well formed and rotating in perfect viewing conditions with nothing obstructing it, this was taken at full 400mm. 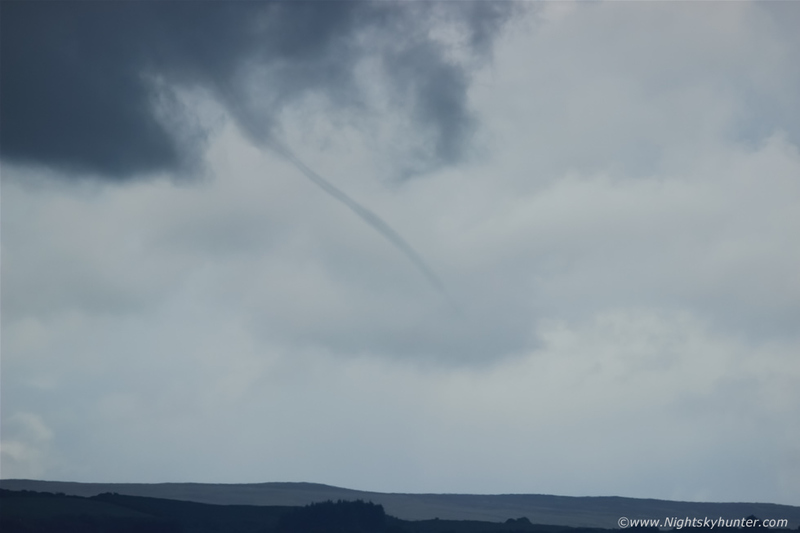 I began alternating between watching the scene unfold through the viewfinder with this lens and comparing it with the naked eye and I soon realised this was not disappearing in a hurry, in fact, it was going to hang around for a while and furthermore it was getting longer, my adrenaline began to pump harder, I couldn't believe I was watching a funnel cloud rite now live after hunting for them for so long, here it was spinning away early on a warm Friday morning only a few min's from home, this was Heaven and I made sure to enjoy every second of its splendid apparition. 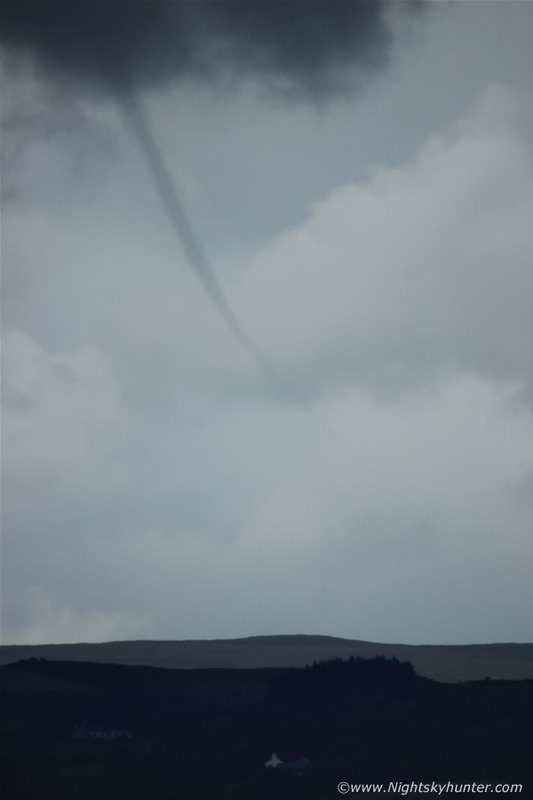 The tip of the spout began reaching lower towards the surface like a snake in the air questing for the ground. I had to back out with the zoom to follow it down. 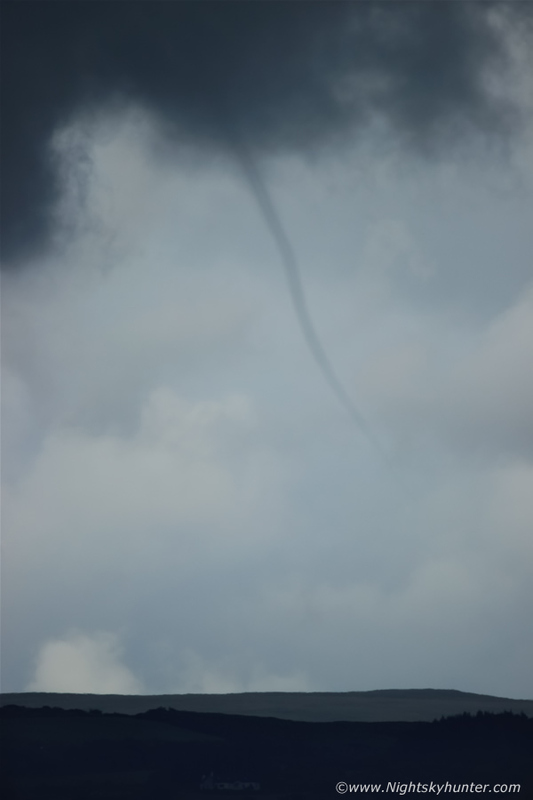 Now a beautiful rope funnel cloud still lowering closer the ground. I had time to take two quick video clips using the DSLR and long lens, it was difficult trying to hold this heavy lens steady at maximum zoom so I leaned against the back edge of the van and controlled my breathing and steadied my trembling hands as best I could. Now at maximum length, look how low it is to the surface, visible to the lower right of frame going on down through the background white clouds, this was miles away yet it looked so clear and well defined. For me this is what perfect Summers are all about, standing in a t-shirt in warm sunshine with a funnel cloud spinning in the skies, this was absolute Heaven, it was calm and the only sound was from the Cows chewing their cud in the fields and the air was rich with the scent of summer fields while this phantom funnel did its silent dance in the skies at the back of a complex of dramatic storm clouds, I could hear the birds chirping, smell the wet grass and feel the sun cooking my face, this moment in time was absolute perfection, this is what I hunt for and live for, the amount of years, miles and hundreds of hours of chasing it took to experience this moment since my last good funnel catch. As far as I'm concerned funnel clouds, waterspouts and tornadoes are the prize catch of any good storm chase, now I was getting my reward. 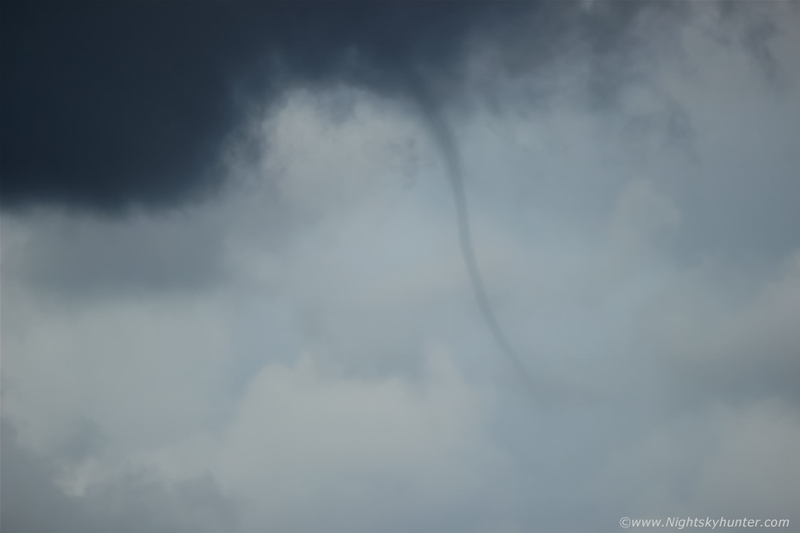 Note the translucent funnel and seemingly two vortices embedded inside the main funnel, then as I watched, the tube shortened and vanished inside the dark base once again and after a glorious ten minutes of wonder the funnel was gone. Same scene only moments after the rope funnel disappeared into the base (right of centre) captured at 10mm wide angle, what a scene after watching that spectacle over these vibrant sunlit fields with mean storm clouds brewing over the mountain, it wasn't even 13.00 yet and already this day had revealed it's secrets to me. I simply stood there in the sun bathing in a glorious concoction of emotions which included excitement, awe and extreme satisfaction. Then my mobile rang, it was Conor, I knew what he was ringing about but before he spoke I cut rite to the chase and asked ''man did you see that? '', I had a feeling he had, and it turned out Conor had watched the entire event from Maghera, then he drove out to meet me and together we stood here chatting away telling our own story about what we saw, it was one of those classic moments for the memories. 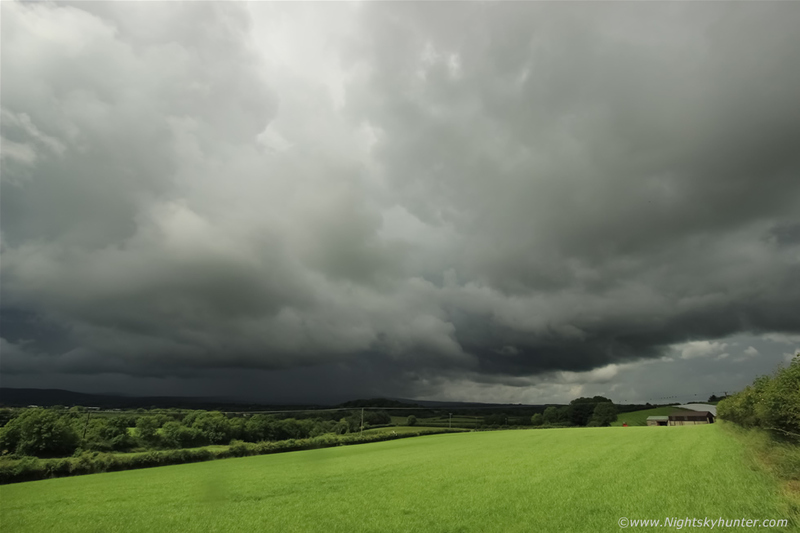 As Conor and I watched this cell grew closer and closer and a times we observed what may have been short lived white funnels over a county house out of frame to the right, we realised this day was not done yet so we went chasing together out the country roads, Conor in his BMW and me in the van, we drove further N to get away from the developing rain and pulled in at another road side where we watched new bases. 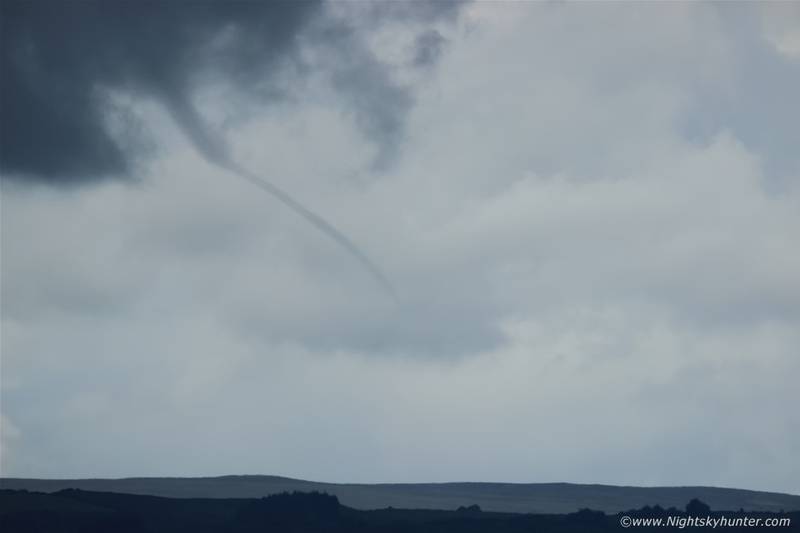 We spotted good rotation from a dark base miles away to our N and E so we gave chase once again through narrow country roads covered in miles of loose stone chips which forced us to drive slow then the cell weakened, after this we turned around in Clady and headed back home to Maghera and it was still only the early afternoon, however this day was already an outstanding success. 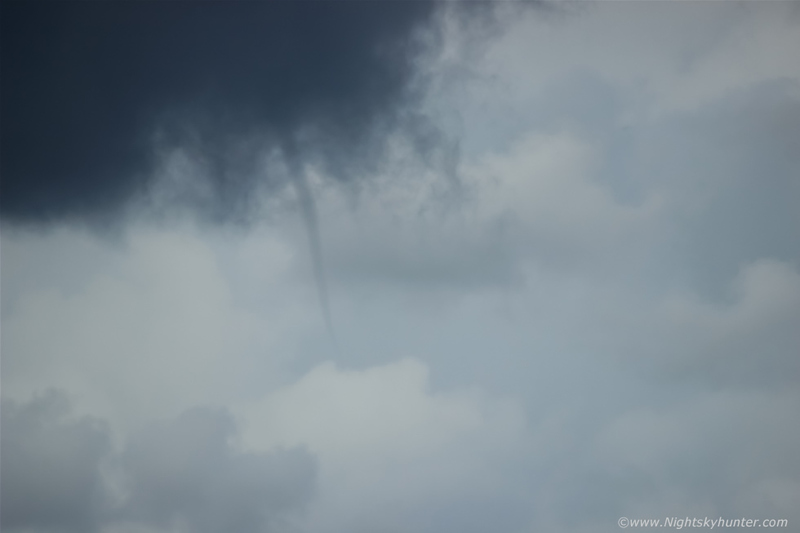 Later we found out that a waterspout had formed over Lough Neagh too which makes two rope funnel clouds and one rope waterspout all within the same 10 mile radius of our home area. While all this was going on I also had the Go Pro tripod mounted on the road beside me, this is a time lapse of the cell and towers which produced the funnel cloud, the funnel is actually present on the wide angle footage however you will need good eye sight to spot it at this focal range, the clouds aloft while the funnel was spinning were quite beautiful and photogenic. The 2016 storm season is currently my best season in years and I already feel satisfied with what I have witnessed over the last few weeks, the Summer is still young so who knows what thrills are waiting to be captured over the next couple of months, thanks very much for reading.